Hyparchive fields can be filtered by stamp to enable a better overview. The dg hyparchive stamps from the selected hyparchive server are listed here. Here, the Intrexx data groups, and when appropriate the fields of parent group and user defined values, are listed. Allow you to assign hyparchive fields and Intrexx data fields. When a data set is saved in Intrexx, then the value of the Intrexx data field is automatically saved in the linked hyparchive field. An important consideration is that the data type in hyparchive must be compatible with that of the Intrexx data field. Opens a dialog where a user-defined value can be created. Opens a dialog where the selected user-defined value can be edited. User-defined Intrexx values are given this symbol in the list. 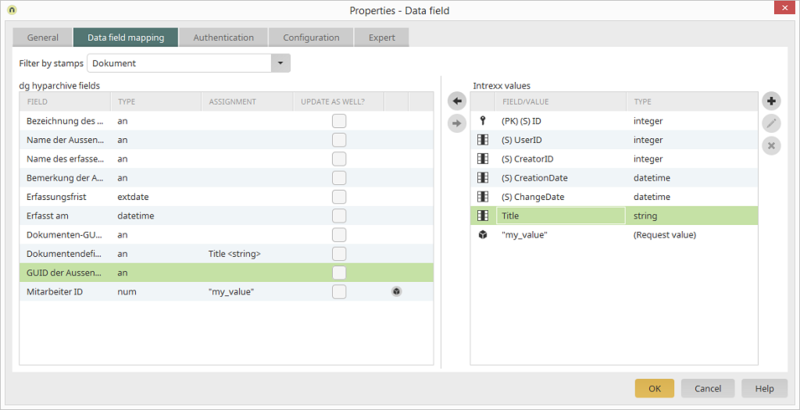 If a user-defined Intrexx value is assigned to a dg hyparchive field, a dialog will open automatically where an Intrexx data field can be selected. The user-defined value is saved in this field. Otherwise, the user-defined value would only be saved in the assigned dg hyparchive field.